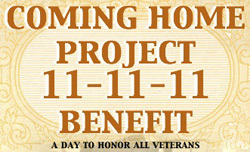 The Coming Home Project is presenting a benefit event on November 11, 2011, at Freight & Salvage, 2020 Addison Rd, Berkeley, CA. For details, download a PDF flyer. The Coming Home Project is a non-profit organization devoted, since 2006, to providing expert, compassionate care, support, education, and stress management tools for Iraq and Afghanistan veterans, service members, their families, and their service providers.